Thanksgiving has finally arrived and as an American in Canada it's always a special treat for me. My family is lucky enough to get to celebrate two Thanksgivings a year, and besides the slight widening of the waistband I'd say it's totally worth it! This year, I decided to try a completely different color palette than the traditional darker berry tones and metallics. While I definitely love a cozy warm palette to set off the darker tones of winter, I also like being a bit playful and colorful with my table-scape. So this year I headed over to our local market for inspiration and was really taken with the mounds of fresh, bright winter citrus, like sweet orange clementines with their stems and leaves still clinging on. I also found some wonderfully rustic ochre Bosc pears and immediately thought of combining the two. I think it's easy to feel really overwhelmed by the idea of designing a dinner table during the holidays and to feel like you have to go all out on a Pinterest-inspired tablescape, but it doesn't have to be complicated to be beautiful. Personally, I usually shy away from anything that includes multiple steps, too much hot glue or washi tape... I know, I know it's cute... but despite all those Pinterest pins showing that adorable washi tape tutorial for making a DIY purse or a cat bed, there are just some things you have to say no to. The most beautiful table is one that is simple but luxurious and is easy to set up and clean up. Who wants to spend hours cleaning up after you've just eaten half a turkey! Enter my secret weapon: the moss table-runner, it's easy, inexpensive and eye-catching. 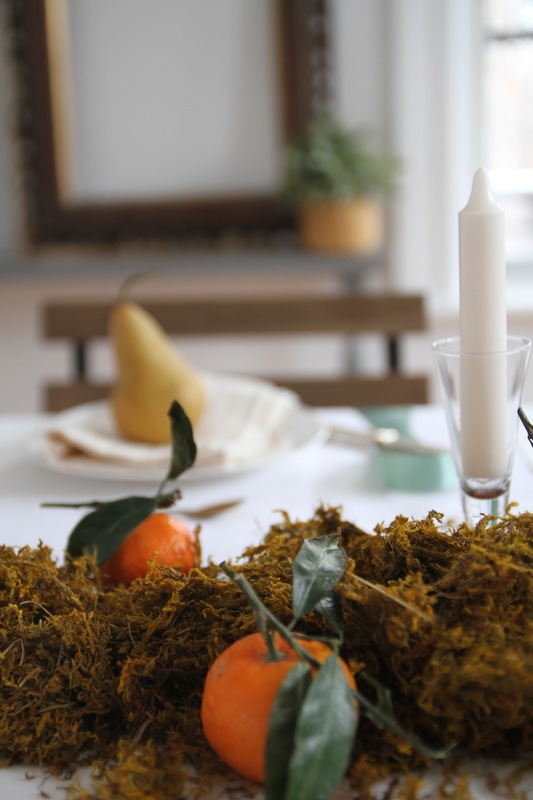 To do this, all you need is a few bags of moss (you can usually find these at your local craft store or florist supply) then just gently pull small clumps of moss, being careful not to spill it across the table and place them down the center of the table. After setting up my moss centerpiece, I placed the clementines throughout the moss and then filled in the empty spaces with candles set in amber shot glasses. In addition to a great centerpiece, I love placing individual menus beside each plate to elevate the experience. It's easily done and just takes a great font, some heavy card-stock paper and your home printer. To make it even more interesting I added simple designs afterwards with a felt pen. Gathering around the dinner table for any event is something sacred and my job as an event-stylist and even as a prop-stylist is to make that sacredness inviting and to encourage others to sit down and enjoy the company, the good food and to soak in all the beauty around the table. I hope these ideas helped bring a little beauty to your Thanksgiving table and remember this little Southern saying: if you burn the turkey, pour more wine. Here at Autumn Wood Stylist HQ we are enjoying our first real snowfall in Montreal, sipping a big glass of Cabernet and getting excited for the Holidays, and as my son Henry said this morning "Merry snow Christmas" to all of you. As always if you're in need of an Event stylist, prop-stylist or set-designer in Montreal or abroad we'd absolutely love to help and be a part of your beautiful moment.